Wikileaks "Vault7 Rabbit Hole" Goes Even Deeper! Wikileaks 'Vault7 Rabbit Hole' Gets Even Deeper! 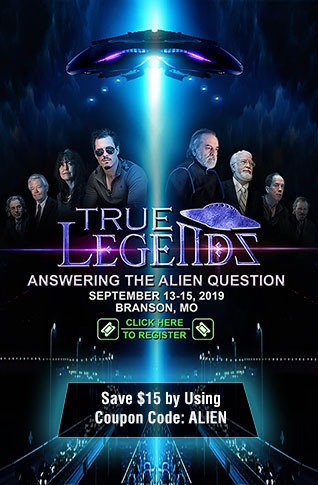 Are They Preparing To Bring Down 'Ringleader' George Soros? The cryptic hints left over the past several days by whistleblowing website Wikileaks have taken another turn for the 'strange' on Thursday as they put out another #Vault7 tweet on Twitter that has some people asking if they might be getting ready to go after 'the ringmaster' himself, George Soros. As we reported on Wednesday, several recent mysterious and quite cryptic tweets from Wikileaks had been 'melting down the internet'. Today, the mystery has intensified. 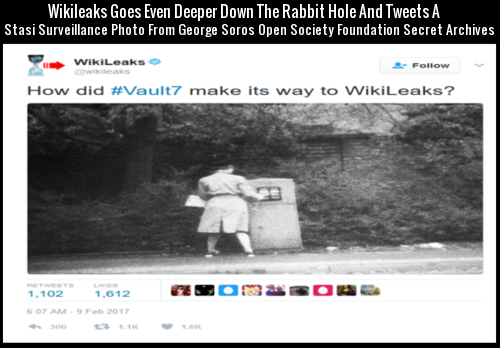 As one Twitter user recently tweeted, "the rabbit hole just got deeper" after Wikileaks put out another tweet asking "How did #Vault7 make its way to Wikileaks?" that included an obviously dated picture of a woman standing at a mailbox. 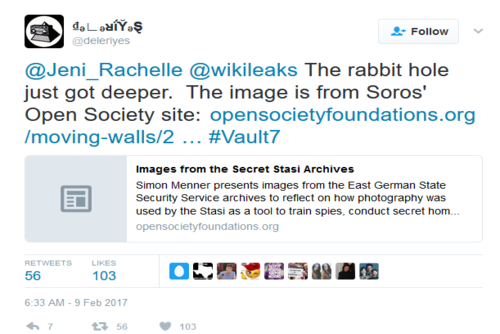 As Twitter detectives quickly pointed out, a reverse image search finds that the photograph Wikileaks tweeted came directly from George Soros' 'Open Society Foundation' in a set of photographs known as "Images From The Secret Stasi Archives" showing part of East Germany's mass surveillance program. As the description on that image states, the image is of the surveillance of mailboxes in Berlin and further elaborates: "When mailboxes were being observed by Stasi agents, every person posting a letter was photographed. Some films found in the Stasi archives also show persons dressed in civilian clothing emptying the mailbox after the conclusion of the surveillance action". Why might have Wikileaks chosen that particular photograph to tweet along with their latest #Vault7 warning? The fact that this particular photograph came directly from Soros' website may be telling. 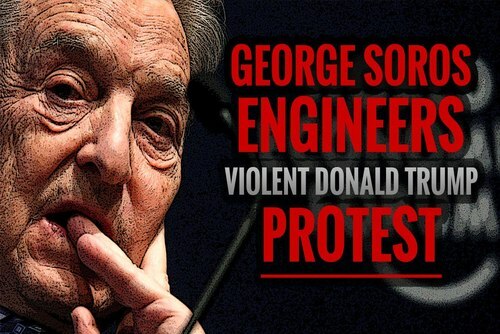 As we've long reported on ANP and can be fact-checked via many different sources, George Soros is the money behind many of the anti-America protests that are going on across the country right now. With many of these recent 'protests' specifically turning violent and the organizer of the recent Berkeley, California protests saying she wouldn't change a thing about the violence that was carried out to stop Milo Yiannopoulos from speaking there and the desire of those participating to 'make America ungovernable', why hasn't Soros been arrested for 'financing terrorism' in America? Additionally, the acts have to occur primarily within the territorial jurisdiction of the United States and if they do not, may be regarded as international terrorism. While ANP believes strongly in the 1st Amendment Rights of Americans to protest, once 'protest' crosses the line to violence as we've recently seen being carried out by 'the left', they've lost any moral high ground the participants might have thought that they previously had. And even they admit that there is a 'political purpose' to their actions. So, what does Wikileaks know that the American people don't know and might they soon go after 'ringleader' Soros? Wikileaks had previously reported on George Soros' ties to Hillary Clinton reporting "Clinton's aides do Soros' bidding". The Washington Times reported Clinton also embraced Soros' radical vision of a borderless world, the 'nwo' we've long been warned of. In fact as recently as May of 2016, Infowars reported that a formerly 'top secret' CIA document connected Soros to terrorist bombings dating back to the 1980's. So why is Soros being allowed to try to 'take down Trump and America?' In the 2nd video below we hear from a California professor who warns us of the 'leftist plan to destroy humanity'. Soros also has a lot of help in the 'overthrow Trump' camp with former Virginia governor and Hillary Clinton running mate Tim Kaine recently calling for 'fighting the streets' sounding almost like the leader of the 'antifa' group BAMN (By Any Means Necessary) named Yvette Felarca who's actually calling for riots and destruction across America. Why would anyone actually WANT to create mayhem in the streets as we hear from her herself in the 1st video below? In the 3rd video below, we see an excellent compilation video proving Soros's ties to protests and terror across America and the world while in the 4th and 5th videos, we get more updates on 'Vault 7' and the 5 W's of investigative journalism spoken by Wikileaks in these cryptic tweets: what, who, where, when, and why with HOW now being thrown into the mix. And while some might still think that Soros' globalism and open borders might be a good thing, this new story from The Christian Post proves to us otherwise. Warning us that globalism is actually 'anti-Christ' and 'demonic', we see in the violent actions of those who believe they're 'social justice warriors' fighting for a cause a small taste of just how demonic it can be. While its been said 'a maniac is running our foreign policy and its not Trump' while alluding to 'terror-supporting' judge James Robart, knowing that Robart is in Soros's pocket tells us who's really pulling the shots. And for those who aren't aware, according to this January 4th, 2017 story from The New American, George Soros himself was a Nazi collaborator who's invoking Hitler in an absolutely ridiculous comparison to President Donald Trump. 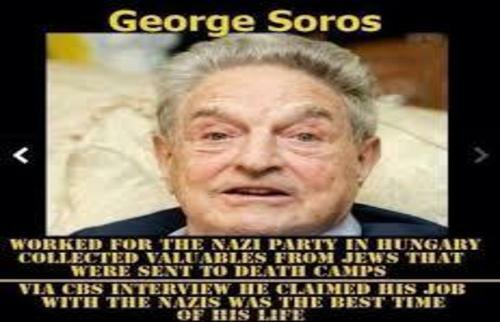 You can hear Soros his own admission of having ties to the Nazi's in the final video below, his infamous interview with 60 Minutes. And in closing, while we still do not have the answers as to exactly what 'Vault 7' is, the fact that Wikileaks continues to put out tweets about it, keeping '#Vault7' in the public eye despite the MSM's refusal to publish any stories on it, tells us that whatever it is, it's not going to just 'go away', though we'd bet someone(s) would like it to 'disappear'. We'll also stand with some ANP commenters who've asked that Wikileaks please hurry up and get this show on the road... the suspense is killing us and besides, America is big-time ready for some truth and for some justice.